In the ancient world when people started noticing that Iodestones (magnetized pieces of mineral magnetite) was able to attract iron it was then only when the concept of magnetism was introduced. Indian surgeon Surushastra was the first person to use magnets for surgical purposes. Magnets: The ability of an object or a material to produce invisible magnetic field lines in order to develop a force which attracts other ferromagnetic materials such as iron, steel, etc are known as Magnets. Magnetism: Magnetism is a phenomenon by the virtue of which there develops an attracting or repulsive force between two magnetic objects. Motion of electrons in an orbit within the nucleus. Spin of electrons around its axis. The spin and orbital moments imparts magnetic moment on each electron, forcing them to behave as tiny magnets. The rotational force experienced by a magnet when placed in a magnetic field perpendicular to its magnetic axis is defined as the magnetic moment of a magnet. Diamagnetism: Those materials which are less susceptible to the magnetic fields are known as Diamagnetic Material and they exhibit a property called diamagnetism, whereby the net magnetic moment of atoms is zero. Thus, when placed in a magnetic field it produces negative magnetization. For Example: Water, Wood. Paramagnetism: The best example of paramagnetic material is aluminium and platinum. Due to partially filled orbital, some atoms possess net magnetic moments, resulting in positive magnetization and susceptibility in the presence of magnetic field. But when the field is removed, the magnetization is zero. For Example: Magnesium, Molybdenum. Ferromagnetism: Unlike diamagnets or paramagnets, those materials which tend to remain magnetized even when the magnetic field is removed exhibits ferromagnetism. This phenomenon is also known as Hysteresis and the plot between variations of magnetism with magnetic field is called Hysteresis Loop. However, at one point or temperature the ferromagnetic materials tend to lose its magnetic properties. This temperature or point is known as Curie point or Curie temperature. For Example: Iron, Nickel, and Cobalt. 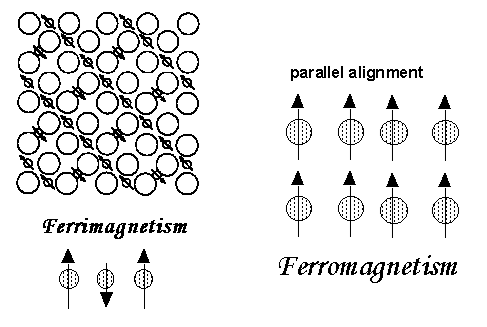 Ferrimagnetism: The basic difference between a ferromagnetic material and ferromagnetic material is that some magnetic domains in ferrimagnetic material point in the same direction while some point in the opposite direction. While in case of ferromagnetic material all the magnetic domains point in the same direction. For Example: Cubic Ferrites composed of iron oxides, Aluminium, Zinc etc. Anti-ferromagnetism: In anti-ferromagnetic material, the magnetic moments of atoms or molecules usually related to the spin of the electrons align in a regular pattern with neighbouring spins in opposite directions. In modern physics, matter is defined as a substance which is made of various types of particles of various size and matter each. In simple language, substance which has mass and occupies space is known as Matter. For Example: Hematite(main ore of iron), oxides such as nickel oxide. Solid: Substances which have definite shape and volume, high density and are not easily compressible are defined as Solid. The inter- molecular attraction (forces that operate within the particles such as atoms, ions etc) in solid is very strong and it holds the particles of the substance close to each other. 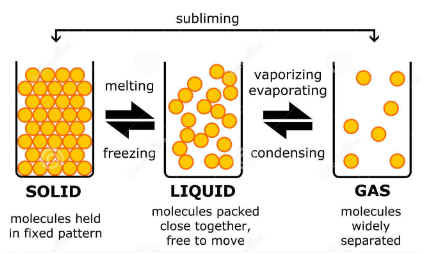 Liquid: Substances which have indefinite shape (takes the shape of a container easily) is known as Liquid. Liquid substances have density less than solids but much higher than gases and they are largely compressible. Unlike solids, the inter-molecular attraction between the particles of liquid are weak and the particles are less tightly held. Hence, they are allowed to move away from each other. Gas: The Substances which have indefinite shape and has low density are categorized as gaseous substance. They have indefinite volume and are highly compressible. Also, the inter-molecular forces between the particles inside a gaseous material are very weak compared to that of liquid and gas. The role of the forces existing between the particles within the substance determines how the substance will behave when placed in Magnetic field. Normally every substance possesses magnetic characteristics. Substances like copper and aluminium which is considered to have high magnetic property is also affected when placed in a magnetic field. Depending on the response of their behaviour tha is, either attraction or repulsion matters are classified as paramagnetic or diamagnetic respectively. 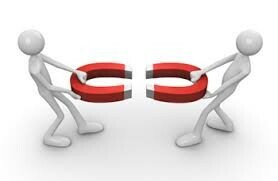 Magnetism is a common and very important phenomenon which finds use in every field. In physics, Magnetism helps to understand the behavioural property of matter. The way a matter responds when placed in magnetic field gives rise to different types of magnetic materials like paramagnetic or diamagnetic as explained above. Thus, it can be concluded saying that matter and magnetism phenomenon is closely related to each other. Q1. Who discovered the Magnet? Sol. Magnet was discovered by ancient Greeks who started noticing that magnetized pieces of mineral Magnetite were able to attract iron. Q2. What is the source of Magnetism? Motion of electron around the nucleus. Spin of electron around its Axis. Q3. What is Magnetism in physics? Sol. In physics, Magnetism is defined as the property by the virtue of which a magnetic material is able to create an attraction or repulsion force. In physics, Magnetism helps to study the behaviour of matter in magnetic fields.